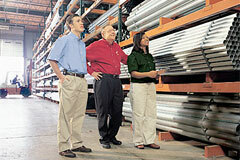 Charles Collatt (center) has helped students see bright futures in industrial distribution. What do you get when you combine business acumen with engineering expertise? For students in UAB’s Charles and Patsy Collat Industrial Distribution (ID) Program, the answer is a future with prospects. The School of Business program blends marketing, management, logistics, and engineering classes to produce graduates with an intimate understanding of how products move from manufacturers to end users. UAB’s program is the only one of its kind in the Southeast and one of only 17 in the country. That kind of scarcity is good news for students: As of January 2009, ID graduates have an all-time placement rate of 100 percent. In 2007, the program set itself apart once again by adding the Medical Equipment and Supplies Distribution track, the only U.S. degree concentration of its kind. Students complete courses in human anatomy, chemistry, physiology, and health-care systems to build a comprehensive knowledge of the health industry. The ID program holds another distinction. The Ben S. Weil Chair in Industrial Distribution, created in 1986 by a gift from Charles and Patsy Collat, among others, is UAB’s first nonmedical endowed professorship.